Typology and allegorical interpretation. One of the important trends in early Christian interpretation (or hermeneutics) of the Bible is the practice of allegorical interpretation, especially of the Old Testament. Scholars today commonly debate whether one can distinguish between typology and allegory. One of the reasons for this debate is that scholars point to confusion in the history of interpretation. Church Fathers, like Origen, provide examples of typology and of allegorical interpretation in their writings and do not provide clear indications of the differences between them. In order to understand the differences between them, it is helpful to understand what allegorical interpretation is. Brief history of allegorical interpretation. One of the early practitioners of allegorical interpretation was Philo, a Jew from Alexandria, Egypt (d. A.D. 50). Philo did not invent allegorical interpretation. It appears that he learned it from Greek writers. They demonstrated the usefulness of using allegorical interpretation to interpret religious works, like Homer. Allegorical interpretation was especially useful in cases where their religious texts (which we would call myths today) presented offensive elements, like inappropriate behavior on the part of the gods. Allegorical interpretation brings out a “deeper meaning” for a religious text. This deeper meaning generally shows that a certain text is actually teaching some valuable moral truth that differs quite significantly from the literal meaning (or surface meaning) of the text. Therefore, even if the gods are behaving badly, their apparently immoral actions are actually teaching something that has moral value. These allegorical interpretations were heavily influenced by teachings of philosophy, like Platonism (philosophical school that goes back to Plato). The moral elements of philosophical teaching are generally the focus. Philo’s unique contribution. Philo’s unique contribution is that he applies the approach outlined above to the Old Testament. In doing so, he finds a deeper, moral meaning in Old Testament texts that sounds like the teachings of Greek philosophy. 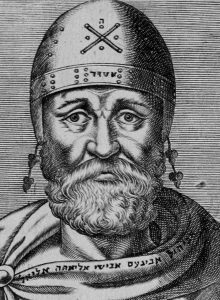 To help him in his allegorical interpretations, Philo often appeals to the interpretation of numbers and to etymologies (i.e., he defines words by breaking them down into their component parts and defining those). What is an allegory? In order to understand what Philo is doing and why it is not a good approach to interpretation, one must understand what an allegory is. A true allegory is a story that has an intended deeper meaning. A good example of an allegory is the parable of the sower in Mark 4:1-20. Jesus tells a story about a sower who sows seed on various types of soil (4:3-8). He then interprets the story and brings out the deeper significance of each type of soil. Each type of soil represents a type of person and their response to the proclamation of the word of God (the gospel) (4:14-20). See also Nathan’s parable to David in 2 Samuel 12. These are stories that have an intended deeper meaning. Thus, an allegory is a type of story that requires the reader to go beyond the literal meaning in order to arrive at its true meaning or significance, like the parables of Jesus. The problem with Philo’s allegorical interpretation. Now, Philo is committing a category mistake. He interprets the Old Testament as if the entire Old Testament was an allegory that God gave to his people. It has a deeper meaning that the informed reader is able to arrive at through allegorical interpretation. What is the problem here? There are only a limited number of true allegories in the Old Testament (like 2 Samuel 12) that should be interpreted by looking for a deeper meaning. The rest of the Old Testament is not an allegory that requires the reader to look beyond the literal sense to arrive at its true meaning. Let’s look at an example from Philo’s works for an illustration. Look especially at On the Migration of Abraham 1:25 (below). Philo, On the Migration of Abraham 1:24-26. 24 For Moses, being the nurse as it were and tutor of good works, and good expressions, and good intentions, which, even if at times they are mingled with those of an opposite character by reason of the somewhat confused medley which exists in mortal man; are nevertheless distinguished when they have passed, so that all the seeds and plants of excellence may not be destroyed and perish for ever and ever. 25 And he exhorts men very vigorously to quit that which is called the mother of every thing that is absurd, without any delay or sluggishness, but rather using exceeding swiftness; for he says that men “must sacrifice the ‘pascha,’ in haste,” [Exodus xii. 12], and the word ‘pascha,’ being interpreted, means a “passing over,” in order that the mind, exerting its reasonings without any doubt, and also an energetic willingness and promptness, may, without ever turning back make a passing over from the passions, to gratitude to God the Savior, who has led it forth beyond all its expectations to freedom. Notice that Philo latches on to “pascha” (the Greek word for Passover) which he correctly relates to passing over. On the literal level, what does passing over relate to in Exodus 12:27? Of course, it relates to the passing over of the houses of the Israelites. But what does Philo relate it to? Notice how he draws out a moral meaning that does not coincide with the literal meaning. He relates the Exodus from Egypt (move from slavery to freedom) to becoming free from the power or control of “the passions.” In doing so, he draws out a deeper, moral meaning from a text that appears to be about a historical event. He also claims that the moral meaning that he finds is an exhortation from Moses himself, the great prophet from the Old Testament. 1. How is the interpretation of Philo like biblical interpretations (or teaching or preaching) that we see in our own time? 2. Why is it dangerous to interpret a biblical text in such a way that your interpretation is not clearly anchored in the literal sense of the text? 3. Philo illustrates the danger of giving too much weight to something other than Scripture. How do we see this in Philo’s practice of interpretation? Where does he learn his method from? 1. Beryl Smalley, The Study of the Bible in the Middle Ages (Oxford: Blackwell, 1952), esp. pp. 2-6. 2. Translation from The Works of Philo Judaeus, the Contemporary of Josephus. Translated from the Greek by C. D. Yonge. 4 vols. London: Henry G. Bohn, 1854-55.